» What’s liberty when safety tops all? What’s liberty when safety tops all? 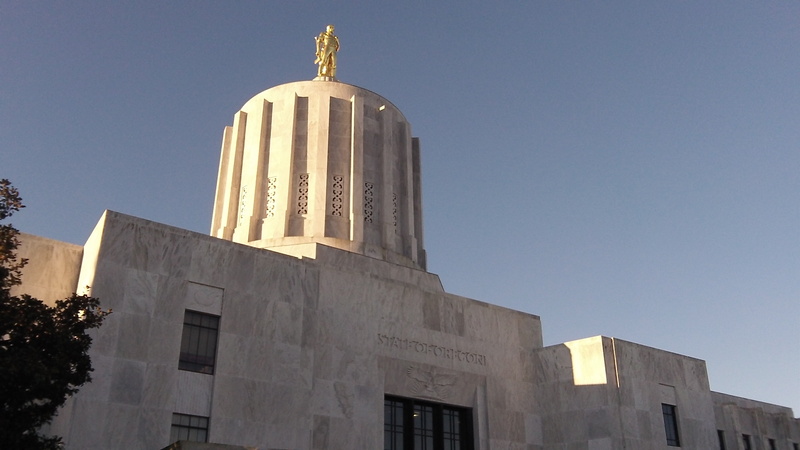 The Oregon Capitol, where liberty has taken a back seat. Gov. Kate Brown has signed SB 941, which infringes on a part of the Bill of Rights in the name of public safety. It doesn’t infringe much more than existing law on criminal background checks for firearms transfers already does. But still, how long before we cut back on rights that are much more dangerous to “safety” than the right to bear arms? What other rights are supposed to be guaranteed by the first 10 amendments to the Constitution? Start with No. 1, religion and free speech and press. Religion is a powerful force. In the wrong hands, it can cause far more death and destruction and general misery than a criminal with a gun. Surely someone can make a compelling case for exercising the state police power over misguided expressions of religion before somebody gets hurt. Even more dangerous: Free speech. Think of all the terrible results that come from listening to a gifted speaker with dangerous ideas. If anything needs a state permit, it’s the exercise of public speech lest it be misused by the reckless, the demagogue and the ill informed. And writing is more potentially dangerous still. The Fourth Amendment protects us from searches and seizures without probable cause. But probable cause it hard to come by. The result is that criminals of all sorts — even rapists and murderers — can do what they do for a long time before they are stopped. They could be stopped much earlier, probably, if the police had a freer hand to search wherever and seize whatever they thought would crack the case. Once criminals are caught, think of how much harder it is to obtain their punishment because the Sixth Amendment — public trials, right to a lawyer and all the rest. Think of the people who got away with something, even murder, because the courts were scrupulous in obeying the Bill of Rights. And if squads of security officers could routinely sweep through whole neighborhoods looking for suspicious items and behavior — from drugs to dangerous books — imagine how much safer we’d all feel. If they were actually concerned with safety, they would institute a state-wide speed limit of 25 MPH. There is no right to speedy transportation. “If it saves just one life, it’s worth it”. That already has happened via the Westboro Baptist Church and their rants against veterans’ funerals. There are others. Where do we draw the line? It conceivably might be if the “writing” is used to foment sedition & revolution… But again — Where do we draw the line? So – Where do we draw the line? How is that decided? And more importanly, who gets to decide? You are absolutely correct. In the names of safety and security we have been giving up individual freedoms since I can remember in the 70’s. I’m sure folks back them thought the same. It does seem like it has progressed significantly since then, however, and I too am frustrated by the trend. No, safety should not top all. I work at a government laboratory, and I recall 20 years or so ago, the head of the division talking to us after a government stand-down due to a mishap. When talking to us he was quite blunt. To paraphrase: Safety is our Highest Priority’ is just not true. If that were the case, we could sit on our thumbs all day, guarantee that no accidents or other mishaps occur, and not get anything done. If Safety is the highest priority, that is the only way to guarantee no accidents. Getting our work done is our highest priority, which does need to be done in a manner that is reasonably safe. But safety cannot be used as an excuse to put into place precautions for which the risk is so low as to be negligible. Risks are measured and balanced with safety regulations and work procedures. This man was a scientist and brought this logical point of view to the division. He is now the head of another large government laboratory that successfully performs all sorts of potentially dangerous work. SB941 IS REGISTRATION by another name. It’s time we put the responsibility on those who are NOT legally allowed to posses weapons instead of those that are. A tattoo on the forehead? I’d have no problem with that. I know a couple of convicted felons that own weapons, weapons they LOST their right to posses upon their conviction for the crimes they committed. By their simple possession of a firearm they are committing another felony, one for which I doubt they will ever have to answer. THERE is a good place to start and leave the law abiding among us alone to protect ourselves against people of their ilk. It’s unfortunate that most people don’t appreciate that without liberty, there can never be safety, safety being a relative concept. Unless we’re speaking of the safety of the grave. And this is the result when emotion substitutes or reason. This is certainly not the last chapter of this book.